Hidden away in the Gracia neighbourhood of Barcelona, Blavis is a small restaurant with a big reputation. 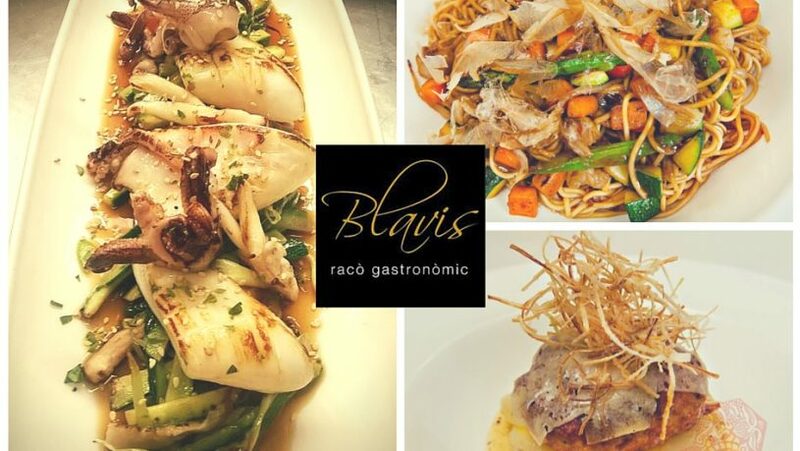 Serving Mediterranean food with fusion elements, Blavis currently occupies the number three spot on TripAdvisor’s restaurant list. A few years back, restaurant-goers spoke of ‘stumbling across’ Blavis. Tucked away in a narrow street in the middle of Gracia, and with a less-than-grandiose exterior, the tiny restaurant was known only to select foodies and locals. No doubt they would have preferred to keep it that way! Today – thanks to a slew of positive reviews and the power of TripAdvisor – the secret is well and truly out there. Although well off the tourist trail, visitors to Barcelona are now braving their way to Blavis, whilst locals continue to enjoy its charms. This popularity, and the venue’s small size, mean that you’re going to need a reservation. Don’t risk turning up without one: most evenings, Blavis’ staff have to turn customers away. You can get in touch by phone or their Facebook page (and probably via the website when that’s eventually launched: www.restaurantblavis.com). There are a host of reasons for visiting Blavis. The interior décor probably isn’t one of them. One reviewer compared Blavis to a South London café. We prefer ‘straightforward‘ or ‘unpretentious’, but at any rate have to agree that there are prettier places to spend time in. However, that doesn’t mean Blavis lacks atmosphere. With space for just 14 to 15 diners, relaxing lounge and jazz music piping through and subdued lighting, Blavis has rather a pleasant, intimate ambiance. The warmth of the staff and the exceedingly happy diners help, too! Although Blavis no longer offers lunches, the way chef Marc Casadument approached these helps us understand his relationship with food. Marc’s lunch menu changed on a daily basis, depending entirely on what produce looked great in the markets that morning. What this tells us is that Blavis is run by a chef that has confidence, a passion for fresh produce, and an ability to invent and improvise. These qualities still shine through in the dinner menu currently offered. Based on Catalan and Basque roots, the tapas menu also incorporates Latin American and Asian influences. With about five staple dishes and five that are regularly changed, the choice is not enormous. Given the quality of what’s on offer, no one is complaining abut that. In fact, for some diners this can be a positive boon, and a relief from those laundry-list menus that go on forever. Sample dishes include aubergine carpaccio with goat cheese and tomato bread, artichoke hearts in garlic butter, beef with chimichurri and scrambled eggs, Mexican pulled pork with guacamole and nachos, prawn ceviche, pork tacos, fried anchovies, and duck with roasted red peppers. More than one reviewer refers to Blavis’ tapas as ‘the best in Barcelona.’ That’s a bold claim, in a city brimming with fantastic tapas joints. However, given the virtually unanimous praise for the quality of the food, it may not be unrealistic! What’s more, with a meal for two diners coming in as low as €60 (and that’s including wine! ), Blavis represents outstanding value for money. Blavis is also notable for its warm and helpful service. At the time of writing, Pablo is doing a sterling job at front of house. He is knowledgeable and passionate about all of the dishes, helping more diffident diners out with recommendations. If your Spanish is a little rusty, there may be some gaps in communication, but visitors seem to manage just fine. The staff also know their wine and are able to advise on the perfect complement to the meal. Our summary couldn’t be simpler: with terrific food, fantastic service and bargain prices, do yourself a favour and book a table!